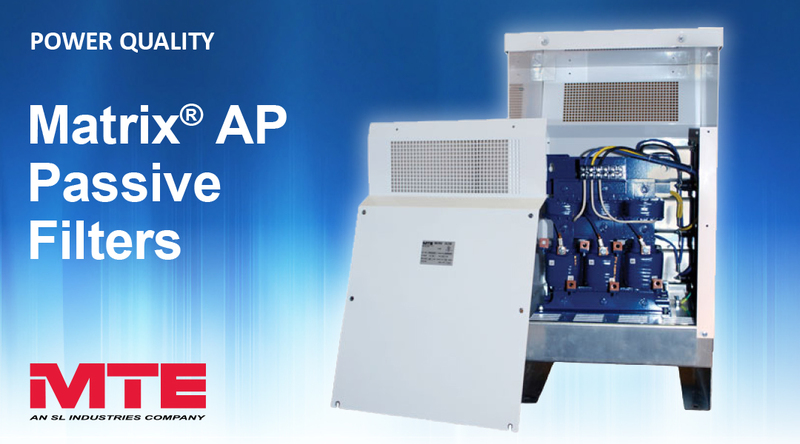 The MTE Matrix AP is the most advanced passive filter on the market today. Most traditional filters work fine at 100% power load but severely under-perform at lower loads. Passive Harmonic Filters represent an economical solution to the challenge of drive applied harmonic mitigation. With a plug-and-play approach and more compact dimensions than comparable products, they can be quickly installed and easily commissioned. The MTE Matrix AP has Adaptive Passive Technology that virtually eliminates harmonic distortion by adapting to various power loads. Its unique design generates less heat, is easy to install & maintain and is generator compatible. It delivers better THID performance, increase the reliability and service life of electric installations, increases energy efficiency and allows you to meet Power Quality standards such as IEEE 519 & IEC 519. The MTE Matrix AP offers equal to or better than 5% THID performance at full load current and starts to achieve that 5% performance from loads as low as 40% of full load current. The unique design of the MTE Matrix AP filter incorporates only one reactor which has the input and the shunt coil on the same core. This requires less cabling and connections by the installer, therefore less cost to install. Alleviates system downtime by preventing blown fuses and tripped circuit breakers. Passive filters are virtually 'Plug and Play'. - The Matrix AP reduces energy costs by improving system efficiency and reliability. - Extends the Service Life of Electrical Equipment Due to the virtual elimination of CEMF and the skin effect, the Matrix AP extends the life of electrical equipment, especially transformers and motors. When the Matrix AP filters are built within an enclosure to comply with IP20 or IP21 requirements, their unique patented design results in such low heat loss that they do not require fan assisted cooling. This design removes the traditional risk of filter damage in the event of a fan malfunction. An optional by-pass contactor version is available which allows the drive to continue to operate in the event of a passive filter shut-down. The Matrix AP filter achieves the majority of electrical providers' leading power factor requirements at a load of 22.5% of full load current. This allows the Matrix AP filter to be used with most generators. Select and install the appropriate MTE Matrix AP harmonic filter in a variable torque AC variable speed drive application within MTE's published system limits and we guarantee that the input current distortion will be less than or equal to 5% THD at full load and less than 8% at 30% load. If a properly sized and installed filter fails to meet its specified THID level, MTE will provide the necessary modifications or replacement filter at no charge. Matrix filters can also provide similar performance in other drive applications such as constant torque, DC drives and other phase controlled rectifiers, however actual THID levels can vary by load and/or speed and therefore cannot be guaranteed. Please consult Fuseco for assistance when applying MTE Matrix AP filters on these types of applications.